marlene b. creative: Floor-Planning on Paper. In the coming months I will be rearranging my home office/studio space to make room for the custom-built desktop computer my husband is putting together for my photography work. I've never had my own office space and it's been years since I've needed to house a desktop computer so this warrants the redesign. 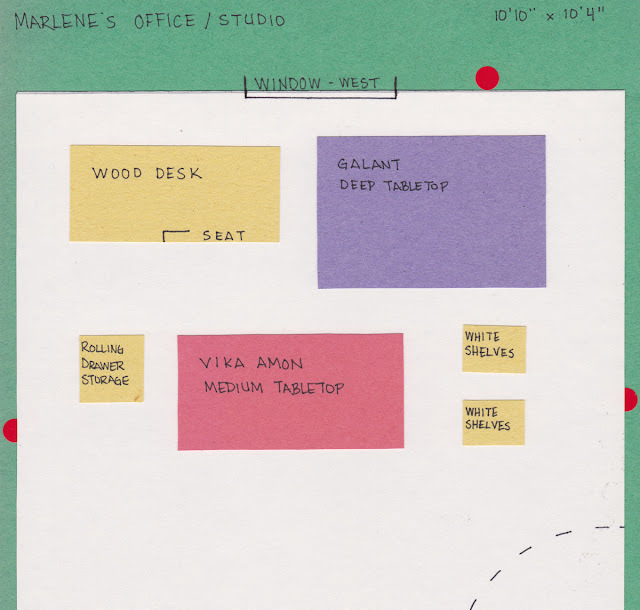 Whenever I begin planning furniture arrangement in a space I make a floor plan. This isn't a simple sketch on paper. I am talking about a two-dimensional, meticulously crafted, scaled-down room plan and I love doing it. I begin by measuring the room, taking note of doors, windows, electrical outlets and other details that may affect furniture placement. Then I measure width and depth on every piece of furniture that may possibly work in the space. In the past I have written the measurements on masking tape and placed it on the the furniture for future reference but I haven't done that recently. After all the measuring is done, which after a move takes a great deal of time due to hunting down pieces and maneuvering between boxes, I then find the graph paper and a clear work space. The ratio to which you scale down is personal preference, mine varies depending on the graph paper's grid. Currently I am using 1:4", or one square equals 4 inches, which means that one foot equals three squares. When I am working with measurements that fall between those parameters I generally round up to stick with the grid, but not always. Once that is figured I graph out my floorspace and start making little furniture pieces. After I'm finished cutting out all the pieces I use them to arrange and rearrange possible furniture placement. For this specific project I began with the measurements and pieces I had made after we moved to our current residence, but because I am adding a new work surface I decided to get more detailed. IKEA has two work space series I am researching, Vika and Galant. I am leaning towards Galant because ergonomics will play a large roll in my desk set-up and the options it offers caters to that, such as adjustable legs; Vika is also versatile and is worth considering as well. I downloaded the buying guides for both series which includes all the pieces and accessories with measurements and prices. With this information I made measured pieces for the various tabletop sizes and a couple of the add-ons such drawers on casters. In order to differentiate between my existing furniture and the two series I affixed the cut-out pieces to colored construction paper. 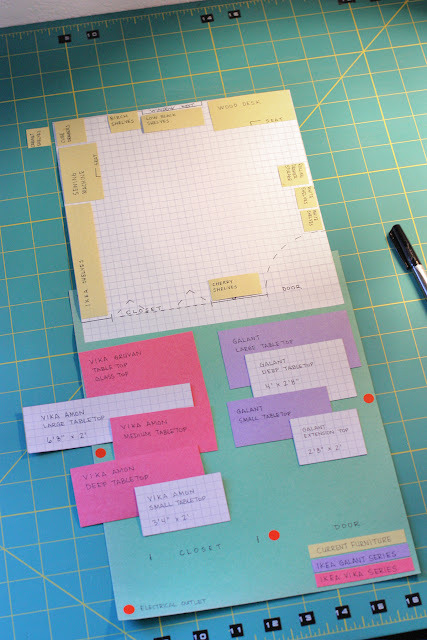 Each piece has the description written on the front, colored side with the measurements on the back, graph paper side. Since I was beginning to get fancy I decided to put the floor plan on construction paper as well and even hinged it to the base paper so it can be flipped up to see details or laid flat to the clean surface. I thought that was pretty creative and something I had never thought of before. The photo shows the floor plan flipped up to show details. The yellow pieces are my existing furniture (shown as the room is currently), the blue is Galant and the red is Vika. Granted I will likely only end up using one of the nine IKEA pieces, I wanted them all so I could play with each in different locations and in combination with existing furniture. In fact, I may be able to incorporate the large IKEA shelves already in there with a new desktop. Most of my small shelving is highly versatile and can be used almost anywhere in the house so some may be repurposed elsewhere to make the room more functional. (The above scan is really not in two pieces and there is about an inch missing there at the division, the scanner decided to split it and I didn't know how to override it, nor have the patience to figure it out; I may try to fix it and edit the post later.) This shows the "clean" version where pieces can be arranged without distraction. I just finished making everything this morning and now have almost everything I need to begin planning my new workspace. It is a fun and exciting process that I plan on sharing as it progresses. If there is any trick you use to plan your work spaces I would love to hear them!